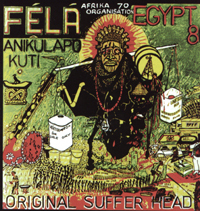 If someone were to ask me if Fela ever put out a masterpiece, I would have to recommend this CD(although, in my opinion, Fela has dozens of masterpieces). The compositions on both albums feature some of Fela's most complex, original, and funkiest music released up to that point. His original idea of creating African classical music had reached a new level of maturity. "Original Suffer Head", released in 1982, starts off with Hammond-organ lines which might remind the listener of Emerson, Lake, and Palmer. That is before the music enters a section that will remind some of the French progressive rock band Magma. Like Christian Vander's music, Fela rides a complex groove as his wives shout out words at irregular intervals. About five minutes later the band falls into one of the most infectious grooves that I've ever heard which also makes-up the majority of the album. The first ten minutes of that groove features a 10-piece horn section, and energetic solos from son Femi, two sax players(alto, and baritone), and Fela himself. "Power Show" is a mellow, yet funky, 14-minute piece featuring more of Fela's organ playing, and interplay between solo sax and his 10-piece horn section. On the CD, it serves as a great interlude for the two lenghty epics. "I.T.T. ", or International Thief Thief in this case, is another funk masterpiece, and it's used as a vehicle for Fela's verbal assault on Nigeria's corrupt "International Telephone, and Telegraph" company. Here he not only denounces the director of I.T.T, but also accuses a former Nigerian president of being a thief and "man of low mentality". Keep in mind that Nigeria at the time was ruled a by dictator and his military. And Fela had been attacked by that military several times between 1978-1982. Anyway, music does not get better than this my friends. This is some of the most powerful funk and jazz ever recorded. And I seriously doubt that it will ever be surpassed.